If York Beach is our playground, York Village is our heart –- our center in so many ways. The Town Hall, the library, and three of the town's four schools are in the Village. 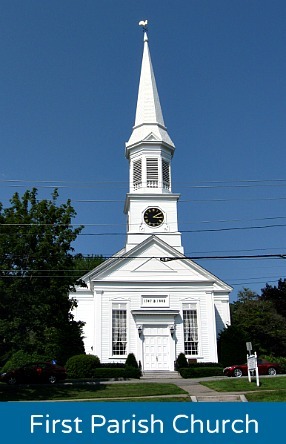 More than two centuries of marriages have begun at the magnificent First Parish Church in York Village, and many of us have generations of loved ones buried in the beautiful cemetery in back of the church. Every Memorial Day, the parade to honor our local veterans goes straight through the Village, pausing there to solemnly lay a wreath at the memorial to each war from the Revolution to Vietnam. York Hospital, one of the finest small hospitals in the region, is in the Village. In fact, you'll often see locals going to the hospital cafeteria for lunch or dinner because the food is so good and it's a bargain as well! And every winter Mike Lee from Lee Tree makes sure that all the bare Village trees are decorated with small white lights – at night when it's snowing, it's magic. 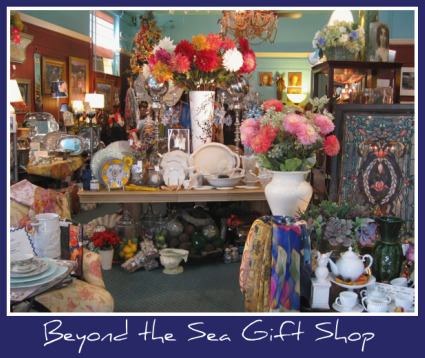 The historic downtown area also provides visitors and locals with charming shops and cafes, and is home to the Museums of Old York, dedicated to the promotion and preservation of historic York. Many of York Village’s privately owned original homes and buildings are also beautifully preserved, including Coventry Hall, the most notable surviving early Federal style residence in all of Southern Maine, and a rare and important part of early American and Maine history. And the Old Gaol (jail)? It's been sitting on the hill overlooking the Village since 1719, one of the oldest surviving British public buildings in the United States. 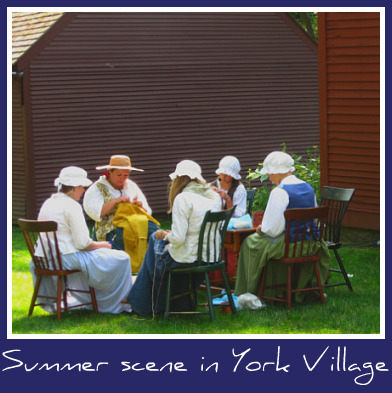 So what can you do in a day in York Village, all within about a mile and half of the town center? Besides sit around in your colonial garb sewing, that is. You can start out by eating breakfast with the locals at Rick's Cafe or the Bagel Basket. Then tour reknowned historic buildings, relax on an old stone wall and contemplate classic colonial-era cemeteries, fish off Sewall's bridge at the York River, visit several art galleries, shop for gifts and antiques in one-of-a-kind shops, have a picnic lunch on the hill of the Old Gaol, have a plate of traditional roast ox and beanhole beans during October's HarvestFest, go to the Christmas Tea at Jefferd's Tavern during December's Festival of Lights, rent the colonial Remick Barn across from the First Parish Church and have your rehearsal dinner or other event there – and there's so much more! And the parking? Always free, everywhere in York Village. In the center of York Village stands a statue. It is a memorial to York's Civil War veterans. 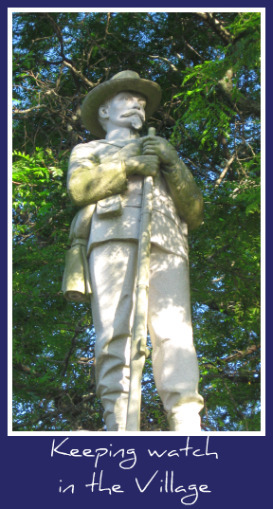 For many years, a story has circulated that our statue is really that of a Confederate, or Southern, soldier. And somewhere down South, the story goes, a town has the statue that was really intended for York, Maine. They were accidentally switched, you see, and each town kept the statue they were given. A quick Saturday morning trip to the Museums of Old York library, a stone's throw from the statue, revealed the truth. Our statue is not an accidental Southern guest. According to the meeting minutes, he was made by the Frederick Barnicoat Company of Quincy, Massachusetts, and he was made exactly as he was ordered. I thought that the really cool things was that in 1906, the keynote speaker at his dedication ceremony was none other than Joshua Lawrence Chamberlain – hero of Gettysburg, President of Bowdoin College, and four-time Governor of Maine. It was Chamberlain that Ulysses S. Grant chose to receive the first flag of surrender at Appomattox, and Chamberlain who gave the order to meet the surrendering Southern army with a salute rather than with humiliation. And although the uniform looks more Confederate than Northern, the committee in York chose to have their statue dressed in the style of a soldier of the more recent Spanish-American War (1898) than the Civil War. As for how the story got started, my guess is that it's because he looks a lot like a young Colonel Sanders from Kentucky Fried Chicken! 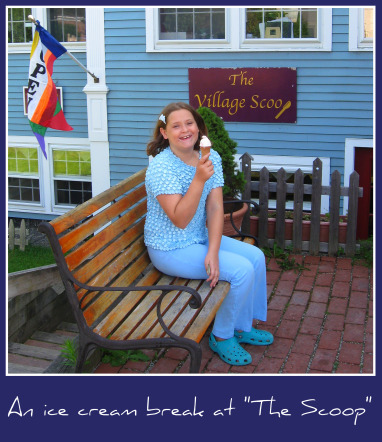 So Go – Explore the Village!